Client Advisor - 2014 Toyota Tundra Custom Show Truck with only 7,949 miles. 3rd Coast Suspension designed and fabricated a 14-inch lift. With the help of B&C Offroad owner Kevin Russell bolted on a large drop-down crossmember up front, with large strut spacers, and Fox coilovers. Out back, a four-link was welded together and complemented by matching Fox coilovers. The 2014 Toyota features American Forces latest faceplate design, the Evade. Thanks to the Tundras five-lug bolt pattern, the huge 24x14 wheels look one part hot rod, one part monster truck. Its a look that is simply stunning. Matching the American Force wheels for form and function, Toyos latest big-diameter M/T tire was added, the 40x15.50R24LT Open Country. Power to spin those massive rollers is left up to the iForce 5.7L V-8. Rated at 381 hp from the factory, this Tundra benefits from Bully Dogs latest tuner, the GT-T. Tuning Toyotas is no easy feat, but Bully Dogs mad scientists have cracked the code. Helping the V-8 breathe easier, an S&B intake and Flo-Pro exhaust round out the go-fast mods. 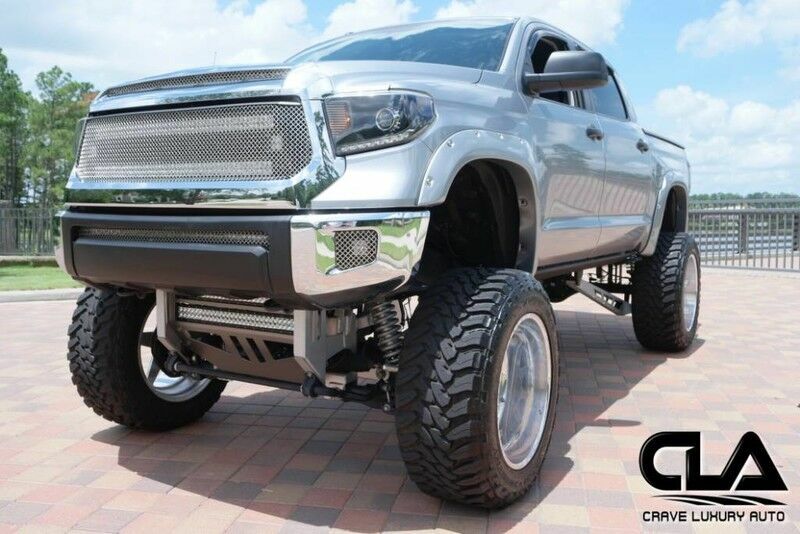 TOYOTA TUNDRA WAS A CUSTOM BUILT BY CODY ELKINS AND SHOWCASED AT THE BULLY DOG BOOTH AT THE 2014 SEMA SHOW IN LAS VEGAS. ALL OF THE PARTS INSTALLED ARE NEW AND IN EXCELLENT CONDITION. THIS TRUCK LOOKS BRAND NEW AND HAS BEEN VERY WELL MAINTAINED. THE TRUCK SITS "36 FROM THE GROUND. ON 24" WHEELS. THE TRUCK INCLUDING PARTS AND LABOR ARE WELL OVER $100,000K CUSTOM PRODUCTS ARE TOO EXTENSIVE TO LIST. CUSTOM 14" LIFT IT COMES WITH A CODY ELKINS CUSTOM INTERIOR WITH BADGING. AFTERMARKET 24" WHEELS CUSTOM STEREO ENOUGH LED LIGHT BARS IN FRONT TO BE SEEN FROM OUTER SPACE. AN AIR HORN THAT SOUNDS LIKE A FREIGHT TRAIN. AUTOMATIC RUNNING BOARDS FOX ADJUSTABLE COILOVER SHOCKS LOTS OF CUSTOM INTERIOR AND EXTERIOR PARTS INCLUDING GRILLS. PRODUCTS FROM SB FILTERS KICKER & Focal component speakers B&C OFFROAD UNDERCOVER FLO-PRO PERFORMANCE EXHAUST TOYO TIRES AMERICAN FORCE WHEELS AMP RESEARCH BULLET LINER ALEA LEATHER SPECIALTIES SOLAR RAYS WINDOW TINTING BULLY DOG TUNER AUTOMATIC CARGO LIGHT 3RD COAST SUSPENSION KEG DIGITAL GARAGE HORN BLASTERS PIXEL WERKS GRAPHICS OPTIMA RACE MESH GRILLS THE TRUCK IS A 2014 TOYOTA TUNDRA SR5 4dr CrewMax 4WD SB (5.7L 8cyl 6A). ANY QUESTIONS PLEASE LET US KNOW. We welcome any pre-buy inspections before purchase and can help facilitate door to door shipping to anywhere in the world at an affordable price. Crave Luxury Auto is located in The Woodlands, TX (north side of Houston, TX). Call us and schedule an appointment to visit Crave Luxury Auto. If you have any questions or would like to schedule a test drive in this vehicle, please call us anytime at 281.651.2101 . Thank You for visiting another Crave Luxury Auto Listing! You can always view our online inventory direct at www.craveluxuryauto.com . If you prefer to communicate via email, one of our representatives are always available at craveluxury@gmail.com . Crave Luxury Auto offers an extensive range of superb, low mile, exotic and luxury automobiles. Trade-in proposals are always welcome.